While the ACT may have the only land based casino that’s not licensed to operate pokies machines, keno is widely available and is hugely popular with recreational punters. We explain what keno games are available in the ACT, where you can play keno in Canberra and surrounding suburbs, and the online keno alternatives that are available. 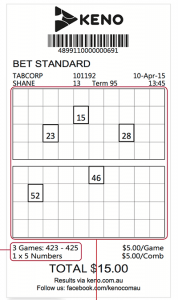 In 2014, Tabcorp acquired the ACT’s TAB network, which included TAB Keno, wagering and Trackside. Tabcorp now holds a monopoly over ACT Keno, pooling jackpots with Victoria and New South Wales to offer wins that can soar into the multi-millions of dollars. If you’re location isn’t on the list you can visit the Keno website to find a venue near you. Tabcorp Keno can be played widely throughout the ACT at clubs, pubs, TAB outlets and shopping centres. The Tabcorp website will help you locate your nearest Keno outlet, with major venues including Casino Canberra, The Italio Australian Club, Deakin Sports Club, Eastlake Football Club, ACTTAB City Centre, Mercure Canberra, Labor Club and many, many more. If you’re in the ACT, you’ll never be far from a TAB outlet, with a new keno game starting approximately every three minute. ACT Keno works just like any standard keno game. It’s a luck based number game that requires no particular skill or strategy to play, making it suitable for recreational players who enjoy a casual punt every now and then. The aim of the game is to select anywhere from one to 20 numbers from one to 80, in the hopes that you’ll be able to match those numbers with the 20 winning numbers that are drawn at random. ACT Keno also offers the special option of a 40 number keno game. To play, you can use a Keno Touch machine or simply grab a keno game card and manually make your picks by crossing out the numbers you wish to play. Alternatively, you can buy a Kwikpik ticket where the computer will automatically select numbers on your behalf. On your game card, mark off the amount you wish to spend per game, with options ranging from $1, $2, $3, $4, $5, $10, $20, $30, $50 and $100, as well as the number of games you wish to play. Register your game card over the counter at your local keno venue, and you’ll be given a keno ticket displaying your chosen numbers, the cost of each game and the number of your keno draw. The ticket also comes with a barcode so you can easily scan to check for any winning numbers. Once you have your ticket, you can watch the game screen to wait until your draw appears and see the results unfold. Alternatively, you can check your results online or by downloading the ACT Keno app for your mobile or smartphone. ACT Keno offers an optional Heads or Tails side bet, which is an easy game that gives you the chance to double, triple or quadruple your money. To play, grab a Keno Heads or Tails game card and mark your selections using a pencil. Select the amount of games you want to play, the amount of money you want to spend per game, and place your bet on either Heads, Tails or Evens. A bet on Heads is that more numbers will be drawn from the top half of the keno grid, a bet on Tails is that more numbers will be drawn from the bottom half of the keno grid, and an Evens bet is that an equal amount of numbers will be drawn from the bottom and top half of the keno grid. How much can I win playing ACT Keno? Always check the rules and payouts for the game at hand so you know how much you stand to win, and how your picks influence the amount you can win. Canberra and surrounding suburbs might be studded with keno outlets, but thanks to the expansion of online betting services, ACT locals no longer need to leave the house to play their favourite number game. Multiple keno variants can be found at several of the leading keno sites on the Web, and with instant real money deposits available in AUD, it couldn’t be easier to play keno from the comfort of your own home. If you’re looking for a safe and reputable place to play online keno Planet Lottery and Lottoland get our top picks.